The Globe Bar & Kitchen transforms into a dance club on Friday and Saturday nights. Spokane has never had a place quite like this. Sure, dance clubs have opened and closed. New bars and pubs always pop up. But a mix of both, concentrated in one block on the city's busiest street? Until now, the city has been missing that. 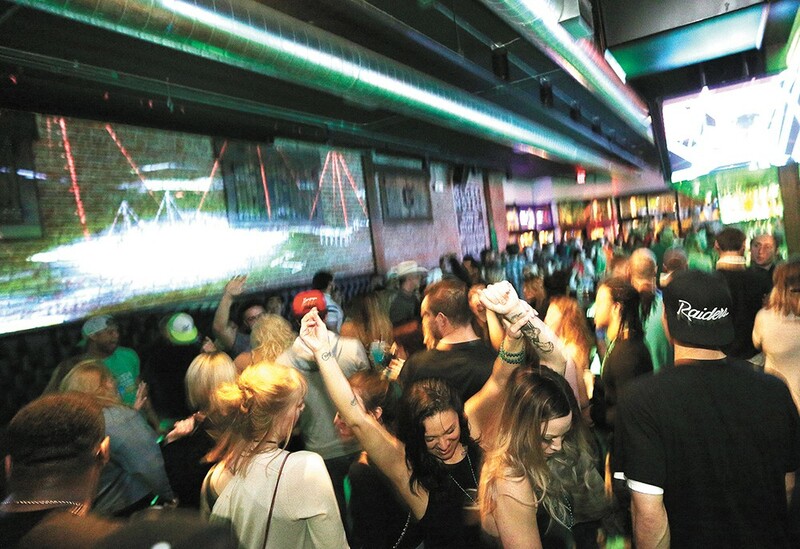 Walk down Division Street between Main Avenue and Spokane Falls Boulevard at night, and you'll see a crowd waiting to get into one of the newer dance clubs on the block. Outside, you might hear a DJ's voice blaring over speakers, welcoming people to the party. You'll feel the presence of a police car hanging out in the area, making sure no one drives drunk or gets into a fight. New ownership in recent years has turned this strip of bars into what it is today — a raucous, drunken retreat for partiers from all over the region. Jeremy Tangen, who bought Fast Eddie's six years ago, saw potential for more entertainment on the block. He was also the owner of MarQuee Lounge, a prominent dance club on Riverside Avenue. After it closed down in 2013, Tangen opened up Borracho Tacos & Tequileria in what used to be Ugly Betties. He wanted the strip to be more than the typical cluster of bars. He wanted DJs, dancing, a good patio and good food. "I wanted people to know they could come to this area of town and find something to do," he says. On the other side of the street, the Blind Buck opened in 2013, followed by the reopening of the Globe Bar & Kitchen in 2015. Both are owned by Ryan and Dianna Bates, who had a vision similar to Tangen's. "It just created a dynamic atmosphere for a younger group, with DJs, a fresh place to go and beautiful bars," Bates says. It's been called the "Bromuda Triangle," and sometimes for good reason. But there's more than what you may think of as a "bro" here. There are people of all ages celebrating their birthdays by spinning the prize wheel at Fast Eddie's, or groups of women out for a bachelorette party. There's an older crowd, maybe sticking around for some more drinks after watching the game. It's the go-to spot for a late night in Spokane. And on a recent Friday night, three Inlander bros joined the party. Some revelers who grew up in Spokane say they don’t recall a nightlife scene like the one on Main and Division. The common Lyft drop-off for Borracho is the asphalt that parts the tequileria from the Revolver and Fast Eddie's. At night, dozens of bar crawlers wearing outfits ranging from slinky club wear to oversized Seahawks jerseys wait to get into the dimly lit bar, named after the Spanish word for drunk. "I just feel like you get sucked in," says Lyft driver Shelby Marvel. "As soon as you go to one of the bars, you end up going to all of them. Everybody's here, there's no escaping it." Once inside, the bar's main source of lighting comes from a dozen televisions and a large projection of 3-D graphics above the miniature dance floor. 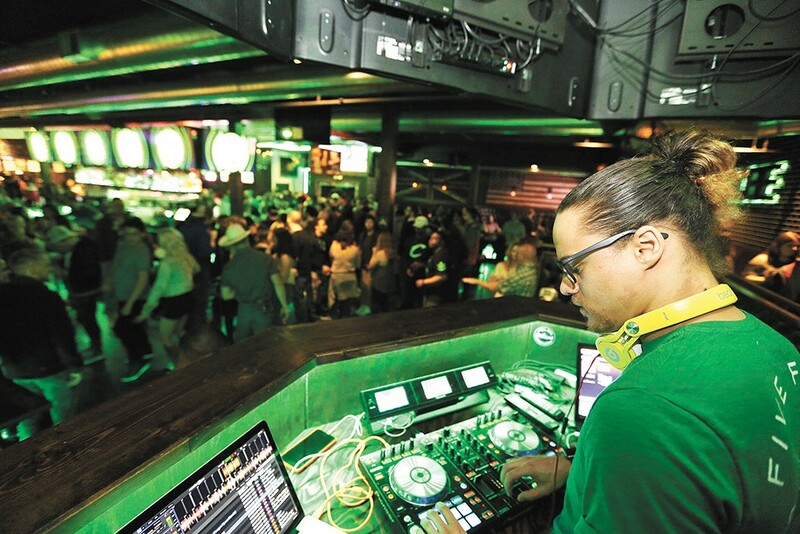 A DJ wearing can headphones bobs his head to his mix of G-funk, contemporary hip-hop and big-room EDM that provides a soundtrack for the peacocking throughout the bar. Around 10:30, a guy in his early 20s, wearing a button-up shirt with sleeves rolled up, orders himself a beer, and a mixed drink for the weary girl he has palmed by the back of her neck. She scoops up the plastic cup and wriggles out of his grasp to go speak to her friends, who form a wall around her. The exchange plays off as routine for both parties. The rebuked bro then shakes his head toward his mates, found farther down the bar. Outside on the patio, there's a fire sandwiched by two large glass panes. Cameron Strauss, a student at Seattle University who's from Spokane, is catching his breath in the middle of a long night. Whenever Strauss visits home, he goes out to this strip of bars. "I love how it's all condensed together," he says. "You can just park your car and go from Fast Eddie's to Borracho to the Globe, and then to the Red Lion." Just in front of the door to the patio, two hulking 20-somethings chest-bump and hug. The one whose hair is in a man bun shouts an all-too self-aware "I MIGHT BE DRUNK!" over the house music. For Steph Dunn, a former downtown bartender, the biggest draw for Borracho is the "fresh meat," she says. This isn't a place where people hang out and talk. This is the scene every weekend on one block of downtown Spokane. A young man in jeans and a T-shirt speckled with raindrops shuffles across Division Street, making his way from the row of establishments on the east side of the street to those on the west. A car stops short to avoid hitting him, and comes to rest close enough for the man to steady himself on its hood. Three police officers looking on shake their heads, and the man gets in a line that's wrapped around the corner. About 100 people are waiting to get into the Globe Bar & Kitchen. "It's like Frogger, watching people down here on Friday and Saturday nights," says Spokane Police Sgt. Kurt Reese. "I'm surprised nobody's been killed. Dozens of people are crossing the street, like, every two minutes." Reese is assigned to SPD's downtown precinct. Today is his day off, but he picked up an overtime shift. On weekends with big events and some holidays, SPD will send a handful of officers to patrol the cluster of bars at Main Avenue and Division Street (Globe, Blind Buck, Borracho, Revolver, Fast Eddie's) and on East Sprague (Mootsy's, Stray, Lucky's Irish Pub, etc.). The thinking is that with cops milling around, drunk people will be more well behaved. In an interview later, Reese says that St. Patrick's Day was fairly typical for a party weekend downtown: a few minor skirmishes that officers handled without arresting anyone. In all, there were eight calls for service for the entire weekend to that block of Division Street, according to police statistics. That's nothing compared to just a few years ago, says Reese. "Nobody wanted to go downtown for nightlife," he says. "But it's changed quite a bit with the downtown [police] precinct and revitalization of downtown." Another man, older and rounder than the dude who was almost hit by a car, clutches four slices of $5 pizza purchased from the nearby whiskey bar. He delivers greasy slices to another group in line for the Globe. Just ahead of the pizza eaters, women in skirts and sleeveless dresses clutch their arms and shiver while men play on their phones. Slowly, the line shrinks as midnight approaches. A group of women walks out of the Blind Buck. Each of them gives the three officers high-fives on their way across the street. One takes a selfie with them. That happens often, Reese says. "People just want to come talk to us. They tell us stories." The majority of people are younger, 20-somethings. But you'd be surprised, he adds: 30-, 40-, 50-year-olds are down here all the time. He sees elderly people on occasion, too. Providing the soundtrack to another festive weekend night. It's past midnight at the Globe Bar & Kitchen, and things are getting weird. By now, people waiting in line have already consumed plenty of alcohol. The DJ plays Huey's "Pop, Lock & Drop It." The now-sticky floor has an odor of sweat and beer. The line of TV screens above the bar, which showed college basketball in the daytime, now flash different shapes and colors to accompany the music. The tables, where families and friends ate dinner hours ago, now serve as a vantage point for onlookers. 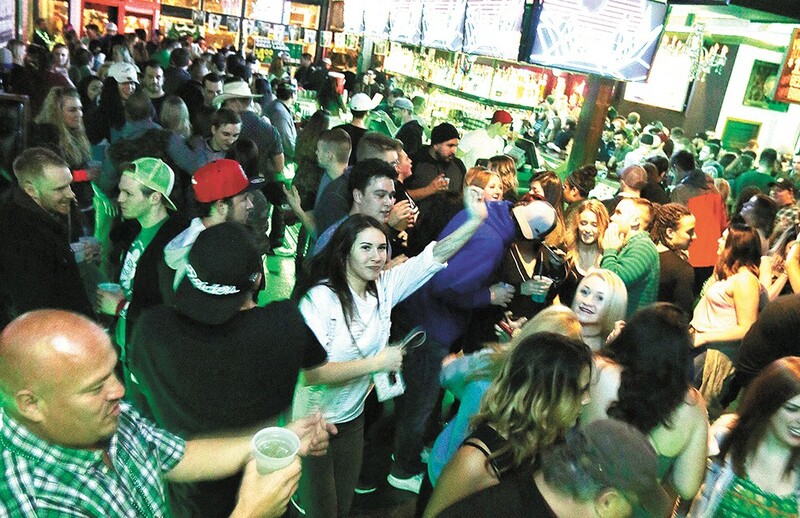 Spokane has always had some sort of club scene, but nothing quite like what you get at the Globe and Borracho, says Tillianni Thompson, who says she comes here almost every weekend. Thompson grew up in Spokane, moved to Portland, and came back around the time this place opened. Spokane's nightlife on this strip of bars, she says, is new to her. "I don't ever remember it being like this at all," Thompson says. Some come here from out of town. Around 1 am, a group of women wearing white tutus walk into the bar and head straight to the dance floor. They're from the Tri-Cities, and came to Spokane for a bachelorette party. 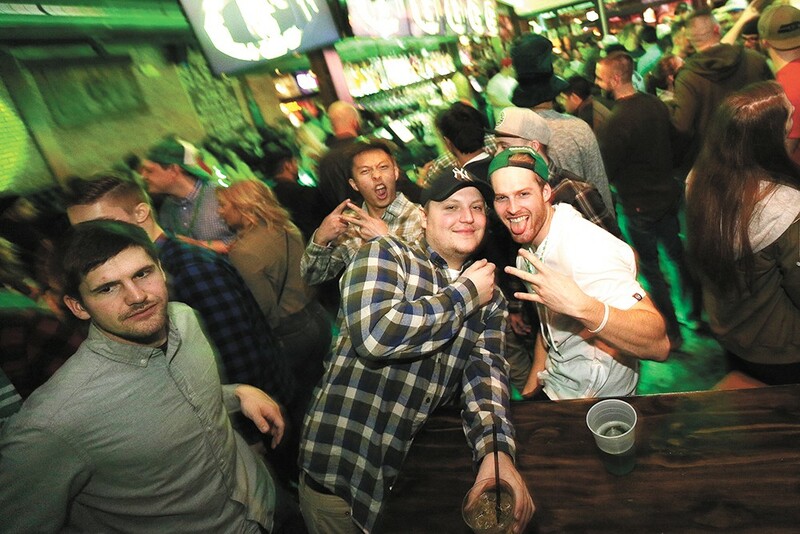 Following the Eric Church concert at the Spokane Arena, the Globe was a no-brainer destination for the afterparty. "There's nothing like this in the Tri-Cities," says Brittney, a friend of the bride-to-be. In the walkway between the Globe and Blind Buck, a security worker blends in with the crowd. He's wearing short shorts and a tank top that exposes his bulging arms. One of several security personnel, he's making sure nobody starts any fights, that everyone there is just having a good time. A guy named Cameron Dietz walks past him wearing a St. Patty's Day stovepipe hat. On his way around the bar, walking toward the dance floor, he hears compliments left and right about the hat. He seems to love it. As it gets later in the night, he says, this becomes the place to be. It's where you meet people. It's where, in the blur of the club scene at 1 or 2 am, girls and guys "start to click."